CONSTELLATIONS Audio visual installation for public spaces, produced by Studio Joanie Lemercier. [#define Moon_ ] consists of 9 rotating kinect light installations. It presents different postures of moon shape, exerting new sense experiences. The audience is allowed to explore through various ways of looking and bring curiosity to the installation by watching from different angles. By thinking of the science spirit, once again, viewer can define and understand the concept of this work of their own. A panoramic projection screen controlled from multi-touch holographic platform. Using the futuristic multi-touch interface the presenter could scroll through sections to choose one he wants to speak about. With a fast hand gesture he would then throw the section's icon to the big screen where it would transform into a colorful video about the main features of the system. Technologies used: Unity3d, C#, Scaleform, Flash, AS3. A project I worked on last year focused on what physical shopping experiences would look like in the coming years leveraging technologies such as AR, VR, etc. These videos highlight some experiences we can expect. 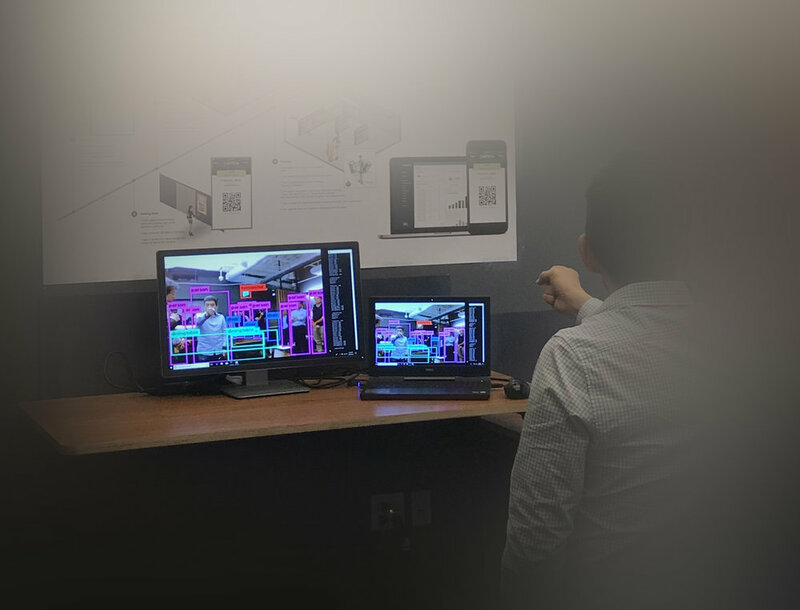 Over the past few years, computer vision has excelled in popularity due to its machine learning capabilities. We are just now starting to scrape the surface of it’s potential and as hardware and chips advance so do the capabilities of AI and computer recognition. This Tesla Full Self-Driving Hardware video gives a great view of one of the essential use cases of this technology and its amazing possibilities. Note the speed and distance of some of the objects it is still able to recognize as it progresses, truly amazing. Image displaying an autonomous retail computer vision prototype I designed and coded. About two years ago I led a team researching deep into the field of AR and VR. Simple focus was how we could apply it into enterprise supply chains. I love seeing Microsoft and Google pushing these concepts forward leading us away from desktop computers and into headset focused interactions. As a lover and creator of interactive light installations the opening of Telestron did not disappoint. Forward thinking, experiential, but a symbolic glimpse into our future. The dark symbolism you realize in the moment as you watch two robots, interact with each other and the crowd. Shining light directly into the crowd as if to almost judge humans as we all looked up to what is going to be our future. Remote collaboration tools can’t come fast enough, and these tools will be a massive benefit for every aspect of a venture lifecycle. Spatial uses the space around you to create a shareable augmented workplace. Remote users can collaborate, search, brainstorm and share content as if they were in the same room. Gesture based sensors like this enable the future of how we will be interacting on a daily basis. This product focuses on leveraging AR (Augmented Reality) to show the possibilities but these types of sensors will surpass the reliance of screens. LITHO itself is a small finger-worn controller that connects to your smartphone or headset. The controller has a touch surface on the underside, an array of motion sensors and provides haptic feedback. Will VR turn the internet upside down? Such an interesting statement and one as a designer and developer could become a reality. Limitations are on hardware distribution but if those are not the limitation are VR browsers the norm. Firefox Reality is a fast and secure browser from Mozilla that is designed for browsing the open web in Virtual Reality. We have collaborated with content creators from around the globe to provide easy access to amazing VR experiences that can be enjoyed directly from Firefox Reality. Currently Available for Viveport, Oculus Go, and Google Daydream. This looks fun, entertaining, and where we will end up with 3D design tools. But the reality of standing for days at a time to create 3D designs tires me. Some inspiration for designers and a reminder of how quickly the world and the way we work is evolving. Dell, Nike, Meta and Ultrahaptics push the boundaries on immersive creativity. Today, we can deliver a more natural creative canvas so designers can focus on their vision – not the technology itself. Dell Canvas is the precursor to a future that will use VR, AR, voice control, a digital canvas and haptic technology (recreating the sense of touch) all working together to let people create in more natural ways. The 30 second mark is quite interesting and odd how the robots move the way they do when humans are walking bye. Manus is a set of ten industrial robots that are programmed to behave like a pack of animals. While each robot moves independently, they share the same central brain. So instead of acting in isolation, they have intertwined behaviors that ripple through the group as people walk by. Experimentation and education are a continual fascination for me especially when it comes to future interfaces. Here is some FUI inspiration and a vision into what our near future interactions will look like. The HoloLamp technology creates a projected tangible interface on each restaurant table-top, so that each customer can select and view the dishes directly on the table-top and in full size in 3D, and finally place the order while remaining seated. The “Out of Control” installation explores the question of Singularity: the inevitable rise of the Super Machine - longed-for or feared - which, according to some theorists, should occur around 2030, i.e. in the blink of an eye. While the emergence of the first Artificial Intelligence remains a sci-fi theme, the nature and associated risks of such technology has long been a topic of reflection for authors. As early as 1946, Murray Leinster’s novel, “A Logic Named Joe”, imagined the excesses of a hypothetical global computer network capable of attaining a pseudo-conscience. The stronger the machine, the more worrying its malfunctioning may be. “Out of Control” deals with this issue from the inside, not from the human but from the machine’s point of view, portraying the inner conflict of a faulty artificial system which suffers an external attack, unaware of what or why this has happened. "Infinite surface to infinity" Stand for the Spanish Agency for International Development Cooperation (AECID) in the ARCO International Contemporary Art Fair The Spanish Agency for International Development Cooperation (AECID) deploys its activity in more than 30 countries through its Technical Cooperation Offices, Cultural Centres and Training Centres.